The bush stone-curlew (Burhinus grallarius) or bush thick-knee as it is also known, is a large, charismatic, ground-dwelling bird. They stand about 50-60cm high, are nocturnal and are most often known by their eerie call heard at night time. Bush stone-curlews look similar to waders, and are members of the wader family, however they are terrestrial and in general their habitat is open woodland. Stone-curlews have a generalist diet feeding mostly on invertebrates but also seeds, snails, frogs, lizards mice and small snakes. Curlews breed throughout spring and summer, laying eggs between August and January in southern Australia and slightly earlier in northern Australia. The eggs are incubated by both parents for 30 days when one or two striped little chicks hatch out. The parents move the chicks away from the nest immediately after hatching and begin to teach them how to feed. Curlew chicks cannot fly until they are about 9 weeks old, so they rely on their camouflage to protect them from predators in that time. 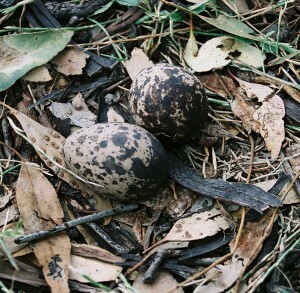 Bush stone-curlews are relatively common in northern Australia, in particular on a number of offshore islands. Unfortunately however curlews have declined significantly in southern Australia and are now classified as endangered in New South Wales, Threatened in Victoria and Vulnerable in South Australia. A Recovery Plan has been developed for the bush stone-curlew in New South Wales, outlining a range of actions that can be undertaken to conserve curlews.